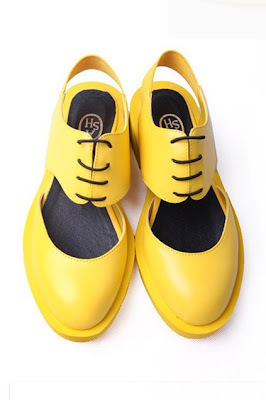 THE CITIZEN ROSEBUD: TRENDING: Sunshine Yellow! One of the "IT" colors for Spring of 2012 seems to be yellow. Not a mellow yellow, mind you, but acid bright-bright as day-yellow. Canary not contrary, this slice of sunshine may be easier to wear than you think. Daydream on this daffodil hued dress from the Creatures of the Wind Spring Collection. Ok, you might be asking a few questions, well no worries! I've got some answers. Like, who is wearing it? 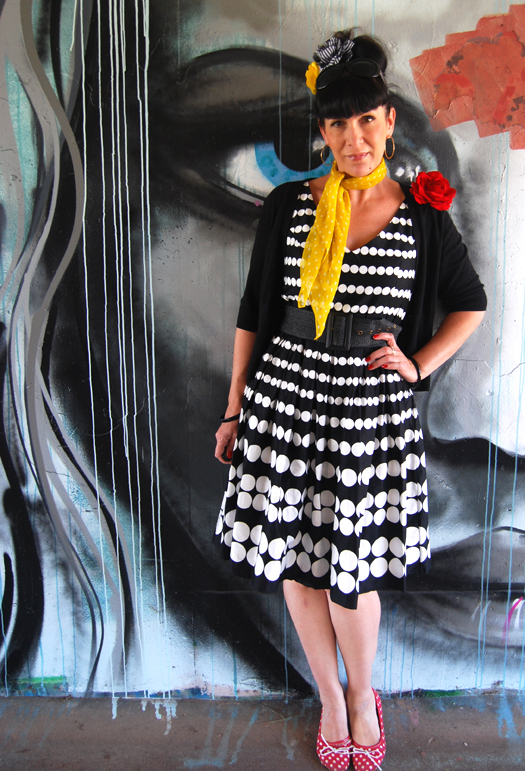 Well for starters, the gorgeous Sarah of Misfits Vintage. As a scarf. With her polka dots. Seattle blogger T.S. get her vitamin D from her colored jeans. She even inspired fellow blogger Mik to do the same. Street Style photog/superstar Lee Oliveria captures the bright buzz of a gorgeous yellow jacket, outside Jean-Pierre Braganza during London Fashion Week. And the Fashionista Next Door rocks her yellow in a pair of sizzling pumps. How about online? I'd be walking on sunshine IF I had this pair of solar powered sandals! You can get 'em at Oasap. How about this adorbs screaming yellow vintage pantsuit from Misfits Vintage on Etsy? Or this '60s mod yellow space age frock found at Market Publique from White City Vintage? No Yolk: Market Publique is stocked with this trending color. Spring is heating up, and you've got this bright summery hue to look to, so say hello to yellow! I would love to get away with a yellow dress but the colour totally washes me out. I think I will have to experiment with accessories in stead. Yes!!!! I like yellow, I love the sun! Yellow is my favourite colour at the moment. It makes me so happy. My favourite accessories are my yellow tights & now my yellow beanie. I love, love yello, kissed by pink. I am glad you like Sarah as much a I do. I do best in a banana yellow. brights kind of scare me a little ;) Though I LOVE the shape of dress #1! Now, what do i have that is yellow??? Aha! A shirt and jeans (both banana(ish) LOL! Hugs and here's to you! I came over to tell you how great your colorblocking outfit looks..but I found a blog that looks amazing..i love all of your changes!! I also, like yellow as well...but your color block outfit is so great!! Yellow is one of my favorite colors. I really want a pair of yellow pumps now!! Ohhhhh, yellow is one of my favorite colors to wear that flippin dress from creatures of the wind made me audibly gasp...loves it! Yowza! I keep seeing bright yellow with a black & white patterned skirt. I want to try a combo like that. Love those solar-powered sandals. I'm liking yellow more and more and this post helps seal the deal. Thank you for joining the colorblocking fun on my blog. You looked gorgeous! Oh yeah, I do plan on working this color into my wardrobe this summer! Fabulous display of yellow! I especially like the yellow hat and checked out the Etsy site. 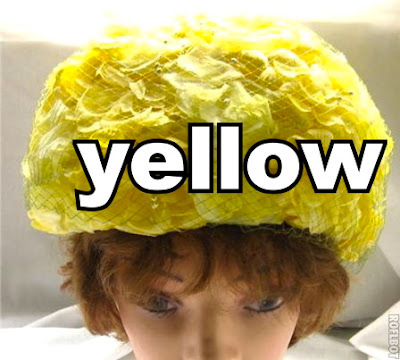 I have some of this yellow in my closet - time to check it out! I know people who are crazy about yellow and I've been told that it suits my complexion...but I'm just not that into such boldness in hue. The small accents (scarves, heels, etc.) are cute though and less of a scary jump! Psyched to wear my old neon yellow shoes another year! I think you are the most inspiring, talented, tenacious woman i've had the joy to find out there!!! As lemon sherberts and lemon bonbons are my favorite sweets, I also have a soft spot for those shades in clothes. It's definitely a feel-good colour, as demonstrated perfectly by the dominant spring flowers here right now: daffodils, dandelions, celandines and primroses. I think my best recollection of well-loved yellow though was my yellow wellies from when I was around age 3. It's the first time I remember adoring the colour of something I wore. I love your new banner and tagline is spectacular! Yellow is one of the few colours that does not suit me at all, but I do love to see it on others. It is the colour of the sun! For me, a tough color. For you in Seattle? Perhaps essential! I love yellow, Im all about it. I have a really nice coat my mom bought me at urbanoutfitters.com for christmas one year. Unfortunately I didnt get to wear it much this past winter cause it was so warm. Yes, it is!! I love the last photo, yellow summer dress with black patent pumps and hot pink ankle socks. I wanna go shopping! I love yellow ,but I notice need more yellow outfits in my wardrobe. Sarita rocks yellow like nobody.